Or do your own action – be creative and be careful. Theatrical demonstration and die-in against Airbus and the militarisation of EU borders. get stuck in dire circumstances or end up in detention and being deported. The military and security industry reaps the benefits of the racist border policies of the EU. Airbus is the second largest European arms producer. It sells aircraft and missiles to countries at war, repressive regimes and human rights abusers. This way it fuels the reasons that force people to flee their homes. Airbus again profits by providing EU with border security equipment to stop refugees. It is a key player in the successful industrial lobby for the militarisation of Europe’s borders. Airbus’ headquarters are in The Netherlands (Leiden). Every year they hold their Annual General Meeting for shareholders at the Hotel Okura in Amsterdam. They celebrate the rising numbers of their profitable deadly business but they fail to mention the rising number of deaths in the Mediterranean, Middle-East and Africa where their products are being used. We take this opportunity to give Airbus a taste of the consequences of their actions. Bring a white sheet for the die-in part of the action. 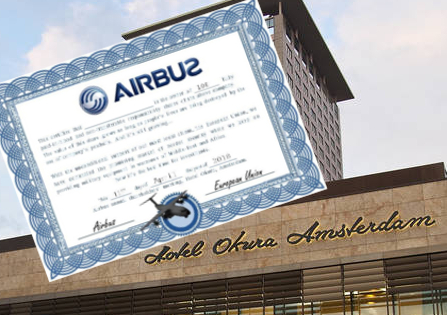 Let Hotel Okura know they should cancel the reservation from Airbus!